Michael Morton and Jenna Morton have opened Greek Sneek next to their CRUSH eat, drink, love at MGM Grand. Accessible via a hidden entrance next to CRUSH, the 2,000-square-foot restaurant accommodates up to 100 guests and offers a menu by Morton Group corporate executive chef William DeMarco of traditional Mediterranean cuisine as share plates, flatbreads and entrées, many of which are prepared in a wood-fired oven. Highlights include crispy zucchini and eggplant chips served with tzatziki; lamb meatball flatbread topped with tomatoes and tzatziki; crab cake with mint yogurt purée, tomatoes, green peppers, olives and capers; shaved pita sandwiches with a choice of chicken, lamb or steak accompanied by tzatziki, tomatoes and red onion; and Mediterranean-spiced marinated shrimp skewer with cucumber and mint couscous. Complementing the food is an array of Greek wines, beers and spirits, an Ouzo menu and Greek cocktails inspired by native fruits and flavors. Greek Sneek, MGM Grand Hotel & Casino, 3799 Las Vegas Blvd. S., Las Vegas, NV 89109, 702-891-3228, 800-929-1111. Bruce and Eric Bromberg’s Blue Ribbon Sushi will be making a comeback in Las Vegas. Their sushi restaurant opened at The Cosmopolitan when the resort debuted in December 2010, and after closing in early 2017, the brothers launched their Blue Ribbon brasserie concept in June of that year at The Cosmopolitan. Their new sushi iteration is expected to open in late 2018 at Red Rock Resort as part of the property’s revamp of its restaurants, but with the word “Izakaya,” which means Japanese-style tavern, added to its name. The eatery will offer a traditional sushi bar with fresh fish flown in daily from Japan, small plates, family-style platters and the brothers’ famous fried chicken with wasabi honey. This opening will bring the Bromberg’s number of Vegas restaurants to four, joining Brooklyn Bowl at The LINQ and two Blue Ribbon Fried Chicken fast-casual locations: one in the Grand Bazaar Shops at Bally’s, and the other within Downtown Summerlin just steps from Red Rock Resort. 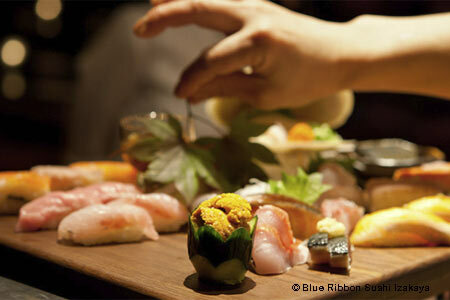 Blue Ribbon Sushi Izakaya, 11011 W. Charleston Blvd., Las Vegas, NV 89135, no phone. Restaurateurs and chefs Susan Feniger and Mary Sue Milliken have debuted BBQ Mexicana, a quick service eatery located across from sister restaurant Border Grill at Mandalay Bay. The concept is a collaboration with Border Grill executive chef Mike Minor, and the menu was inspired by Feniger and Milliken’s travels to Mexico and chef Minor’s TruckUBarbeque food truck which married his love for Mexican food and barbecue. The eatery smokes everything in-house, utilizing only meats raised without hormones or antibiotics; and also offers non-meat options prepared as burritos, bowls and salads, along with margaritas, aguas frescas and beers to-go. Menu highlights include a burnt ends burrito with slow-smoked brisket and BBQ mole sauce, smoked tofu bowl with cilantro lime rice and habanero BBQ sauce, coop bowl with mesquite smoked chicken and crispy quinoa and chopped kale salad with coriander vinaigrette. Hours are Monday through Friday 11 a.m.-4 p.m., with select weekends and mornings. BBQ Mexicana, 3950 Las Vegas Blvd. S., Las Vegas, NV 89119, 702-632-7777, 877-632-7800. Silverton Casino Hotel is offering the Meal with a Mermaid deal on Saturday and Sunday with one seating at 11 a.m. and one at noon. During the 45-minute dining experience, situated next to the 117,000 gallon aquarium, a mermaid swims and interacts with guests. Included are a choice of beverage; starter choice of a basket of donuts, bananas & apples or yogurt & granola parfait; entrée choice of cinnamon bun french toast, blueberry pancakes, all-American breakfast, country fried steak & eggs, turkey & avocado club, tuna or chicken salad sandwich or chicken Caesar wrap; and for the children, a buffet with macerated pineapple with honey yogurt, cornflake-crusted french toast, chicken fingers & fries, and grilled cheese and ham sandwiches with kettle chips. Price is $30 for adults and $15 for children 2-12 (children under 2 are free). Reservations must be booked at least 72 hours in advance here and there is maximum of four tickets per purchase. Silverton Casino Hotel, 3333 Blue Diamond Rd., Las Vegas, NV 89139, 702-263-7777, 866-946-4373. Osteria Costa at The Mirage is now offering brunch on Sundays from 9:30 a.m.-2 p.m. The menu features a mix of sweet and savory breakfast and lunch classics in addition to the restaurant’s most popular dinner items. Menu highlights include organic eggs ‘cacio e pepe’ with caciocavallo sauce, pecorino romano, black pepper and pink peppercorn; baba al rhum toast, regionally-inspired french toast coated in a rum-based syrup topped with caramelized bananas and Nutella; lemon ricotta pancakes with blueberry conserva, whipped cream, powdered sugar and fresh lemon zest; avocado ‘bruschetta’ toast, grilled sourdough bread smothered with avocado spread, Calabrian chili oil, white-balsamic-pickled onions and a poached egg; and house-made linguine tossed in carbonara sauce with pecorino romano. Osteria Costa, The Mirage, 3400 Las Vegas Blvd. S., Las Vegas, NV 89109, 702-692-8482, 800-627-6667. Fresco Italiano at Westgate Las Vegas Resort & Casino is offering a six-course chef’s tasting menu. Priced at $65 per person, the menu includes an amuse-bouche of beef tenderloin crudo over crouton; sautéed shrimp on roasted tomatoes polenta; house-made potatoes and ricotta gnocchi with leeks, asparagus and pancetta; house-made pasta stuffed with ricotta, pulled pork, braised apples and brown butter sage; roasted whole Cornish hen with fingerling potatoes and oven-roasted veggies; sliced grilled NY strip with arugula, shaved Grana Padano and truffle oil; and semifreddo – classic Italian gelato with brittle and chocolate sauce. The tasting menu is served family style and is available for parties of four or more. An optional wine pairing is available for an additional $15, with each course paired with an Italian wine. 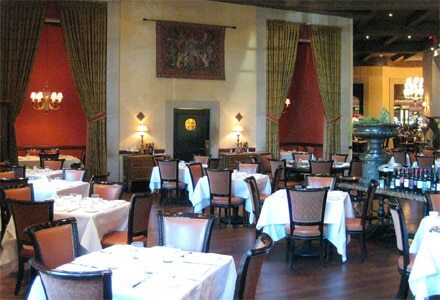 Fresco Italiano, Westgate Las Vegas Resort & Casino, 3000 Paradise Rd., Las Vegas, NV 89109, 702-732-5276. French chef Daniel Boulud (of Daniel in New York City, one of GAYOT's Top 40 Restaurants in the U.S.) pioneered the "Gourmet Burger Revolution." So, it’s only natural that on Bastille Day, July 14, 2018, he launched "THE UMAMI FRENCHIE" with the famous UMAMI BURGER chain. (The timing was lucky as France won the 2018 FIFA World Cup the next day!) Discover the tasty burger, presented by Boulud himself, in this video. Then, go try it for yourself at UMAMI BURGER in Las Vegas. Part of UMAMI BURGER's Artist Series, "THE UMAMI FRENCHIE" ($18) will be available until September 14th. One dollar from each burger sold will benefit charitable organization Citymeals, which provides a lifeline of nourishing meals and vital companionship to New York City’s homebound elderly. Umami Burger, SLS Las Vegas, 2535 S. Las Vegas Blvd., Las Vegas, NV 89109, 702-761-7614. Searsucker at Caesars Palace is partnering with Absinthe – the adult circus show with eccentrics performing amazing feats of strength, balance, danger and unfathomable flexibility – to offer a dinner and show package. The two-in-one package starts at $149 per person and includes offerings from the menu at Searsucker, a complimentary Moscow Mule inspired by the hit show and one reserved seating level ticket to the show. The menu, curated by executive chef Stephen LaSala, includes a choice of yellowtail crudo, tomato and burrata, shishitos or pig ears; brick chicken, scallops, pasta or Chef LaSala’s ricotta and roasted cauliflower steak; cookies + gelato dessert; and a Russian Acrobat Mule, featuring Molet’s super floral gin and ginger beer served in a copper take-away mug. To purchase the dinner and show package, call 855-234-7469 or visit here and choose the add-on when selecting your seats for the show. Searsucker, Caesars Palace, 3570 Las Vegas Blvd. S., Las Vegas, NV 89109, 702-866-1800. Don Vito’s Italian restaurant at South Point Hotel, Casino & Spa is offering a three-course (appetizer, entrée and dessert) summer meal deal for $19 per person and a bottle of the Wine of the Month for an additional $20. The specialty menu includes a choice of Caesar salad, minestrone soup, pasta e fagioli, herb and roast garlic ricotta dip or mozzarella fritti; chicken Marsala, fettuccine Alfredo, orange roughy Marzanno or spaghetti & meatballs; and Vito’s sorbet or black cherry ice cream. The summer meal deal is available Sunday through Thursday from 5 p.m. to 6:30 p.m. until Thursday, August 30. Don Vito's, South Point Hotel, Casino & Spa, 9777 Las Vegas Blvd. S., Las Vegas, NV 89183, 702-796-7111. Michael Mina’s Pub 1842 at MGM Grand is now serving brunch on Saturdays and Sundays from 10 a.m.-4 p.m. The new menu includes The Pig and The Waffle (cheddar chive cornbread waffle with Carolina BBQ pulled pork, a fried egg and chipotle crema); Bacon, Shrimp & Grits (Anson Mills white cheddar grits paired with grilled shrimp, grilled Hobbs thick-cut bacon and a poached egg); Monte Cristo (layers of country ham, roasted turkey and smoked Gouda and Swiss cheeses and raspberry chipotle compote); Avocado & Lobster Toast (guacamole, Maine lobster, cucumber, breakfast radish and lemon vinaigrette); and Smoked Beef Brisket Hash (fried potatoes, jalapeños, red bell peppers, caramelized onions and two over-easy eggs mixed with smoked beef brisket). Complementing the brunch items are a house-made Bloody Mary with Jack Daniel's whiskey, bitters and a dash of BBQ sauce; and a brunch Bellini made with white peach purée, lime juice, chai tea syrup, peach bitters and Champagne. Pub 1842, MGM Grand Hotel & Casino, 3799 Las Vegas Blvd. S., Las Vegas, NV 89109, 702-891-3922. Andre’s Bistro & Bar has launched an afternoon tea program, available Saturday and Sunday from 12:30 p.m.-4:30 p.m. and priced at $26 per adult and $15 per child. Highlights of the tea selection are Tai Ping Hou Kui, an organic green tea with distinctive notes of bamboo leaf; Old Tree Yunnan–Lao Shu Dian Hong with unique wild flower aroma and complex finish; and Rock Wulong Tea–Rou Gui with complex flavors. The sandwich selection consists of smoked Scottish salmon with asparagus spears, chicken salad with cranberries and walnuts, fresh dill cream cheese and English cucumbers and egg salad. Also included are soup du jour and an assortment of English style scones (served with Devonshire cream, lemon curd and preserves), breads, French pastries and desserts. Offered at an additional cost are a High Tea Fizz cocktail for $14, Collet Brut Champagne for $16, Bichot Cremant De Bourgogne Rosé for $10 and bottomless mimosas for $24. View the complete menu. Andre’s Bistro & Bar, 6115 S. Fort Apache Rd., Las Vegas, NV 89148, 702-798-7151. Batali & Bastianich Hospitality Group (B&BHG) has closed three of its Las Vegas restaurants: Carnevino at The Palazzo Resort Hotel Casino, B&B Ristorante and Otto Enoteca Pizzeria at The Venetian. Carnevino, The Palazzo Resort Hotel Casino, 3325 Las Vegas Blvd. S., Las Vegas, NV 89109, 702-789-4141.